To the Light House by Virginia Wolf is one of the best book I have ever read. 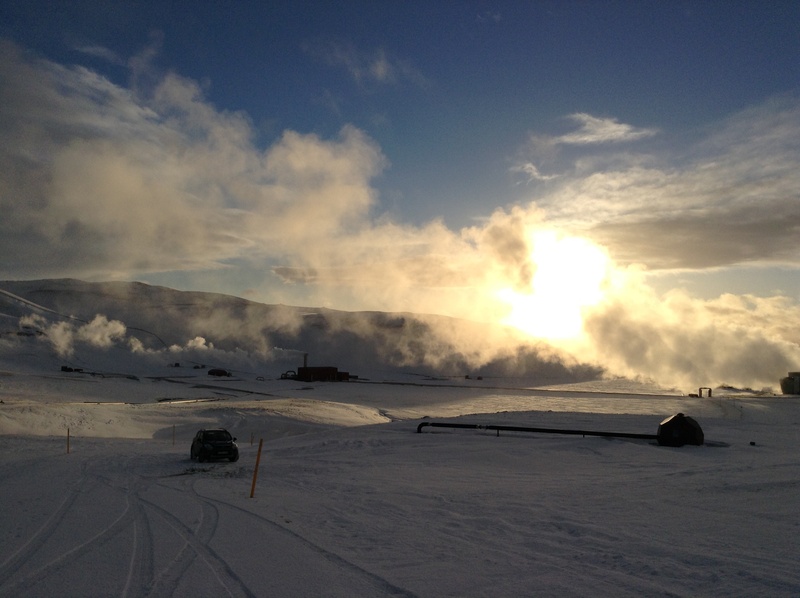 For some reasons that are still unknown to me, when I arrived to Iceland on Jan 1st 2015 a sadness caught me so deeply that it became more of a depressive state of mind. 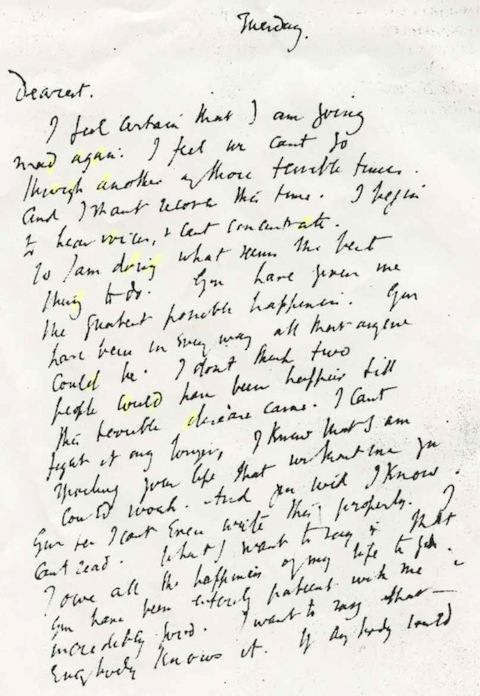 The only beautiful piece of literature that came up to my mind in those first days in North West Iceland, was the letter that Virginia Wolf wrote to her relatives and friends explaining clearly the motif that brought her to drown herself in the river near home, after loading her pockets with stones. A detail so important to the motivation of Wolf’s suicide: a rational determination to end a suffering status of intolerance. This is the reason why I titled this post with Virginia Wolf famous novel: to the Light House.In fact, with some young women of the local artists residency, mostly coming from Northern countries, I did went to the light house of Kálfshamarsvík, near the community of Skagastrond in North West Iceland, in a windy and snowy dark morning. Was it a beautiful experience ? No, I lost one of my gloves, but it was the first pit stop outside the community and the starting point of a little adventure. 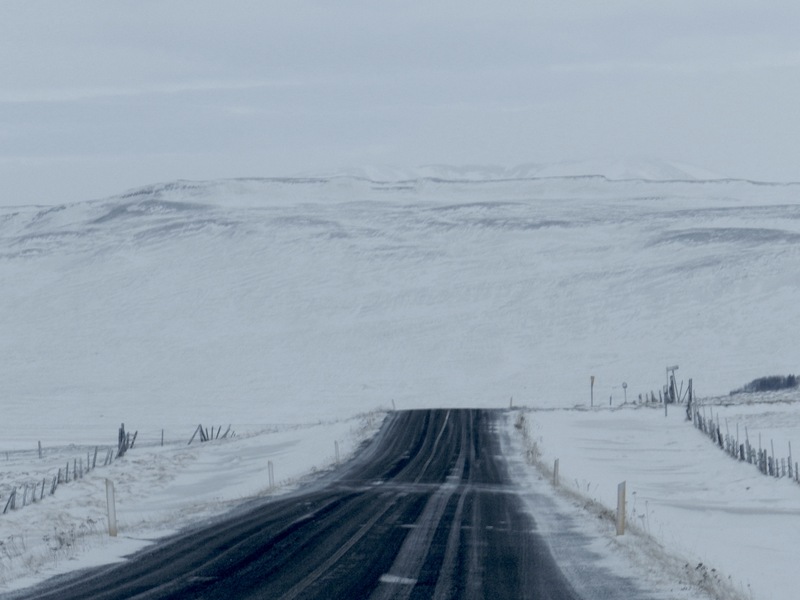 I must say that I wanted desperately to come to Iceland; to the North of Iceland and in winter. Despite the weather. I knew that it wouldn’t be so easy to adjust myself to the darkness and to the wind. I am a very anxious person, but not really a depressive one. Remotness, or isolation because I should had living for a while in a community of less then 500 people hasn’t ever been the real problem. I can isolate myself anywhere I go. 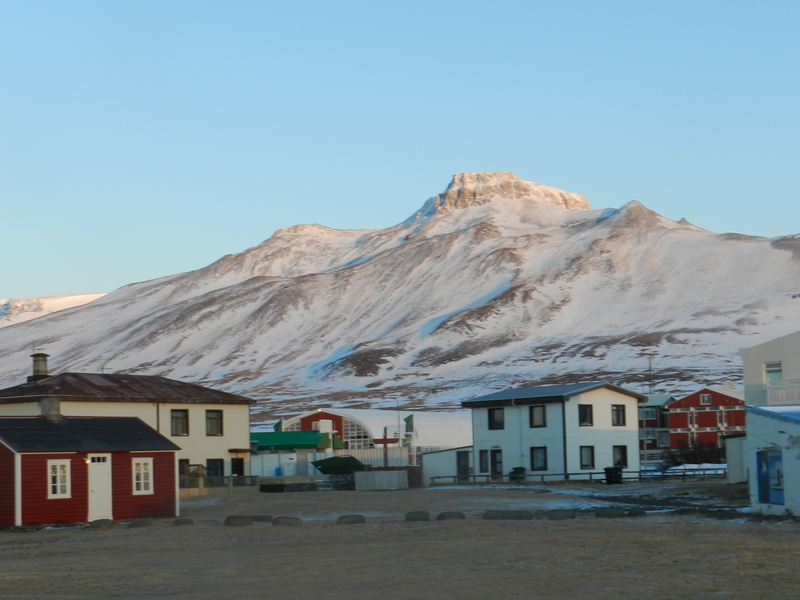 Besides, the community of Skagastrond is very well organized. There is everything you really need. Therefore, the sense of organization and the kindness of its inhabitants, gave me confiance. Not the wind gusts. The feeling of depression rose suddenly when my mistakes, my loss, my frustrations of all my life popped out from my soul in a negative way with no advisory alarm. The journey had to go on as planned. But Iceland is not that Nordic culture that I believed to be. People are quite outgoing and the land has an overwhelming nature who rapidly changes. A condition for having a good amount of flexibility in planning. 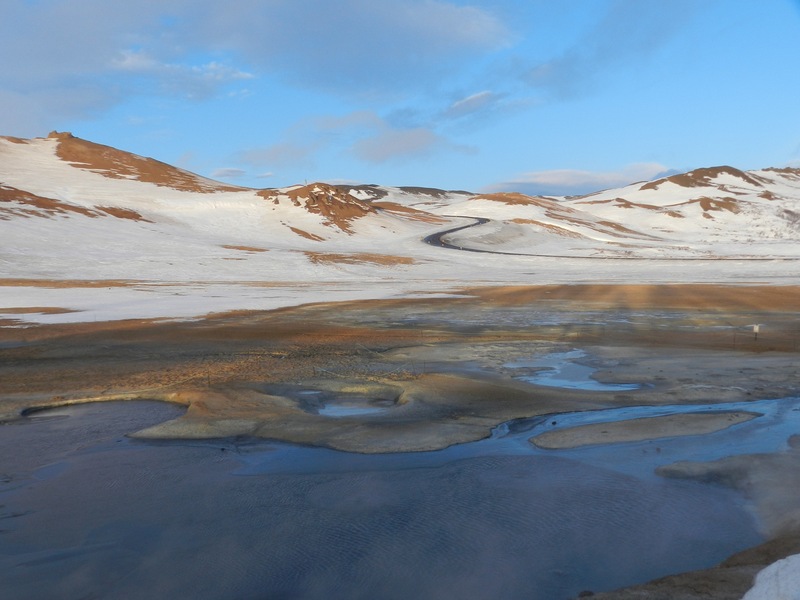 It is so that I finally had the opportunity to drive into the beautiful fjord of Akureyri, the second major town of Iceland with a population of 18.000 inhabitants. 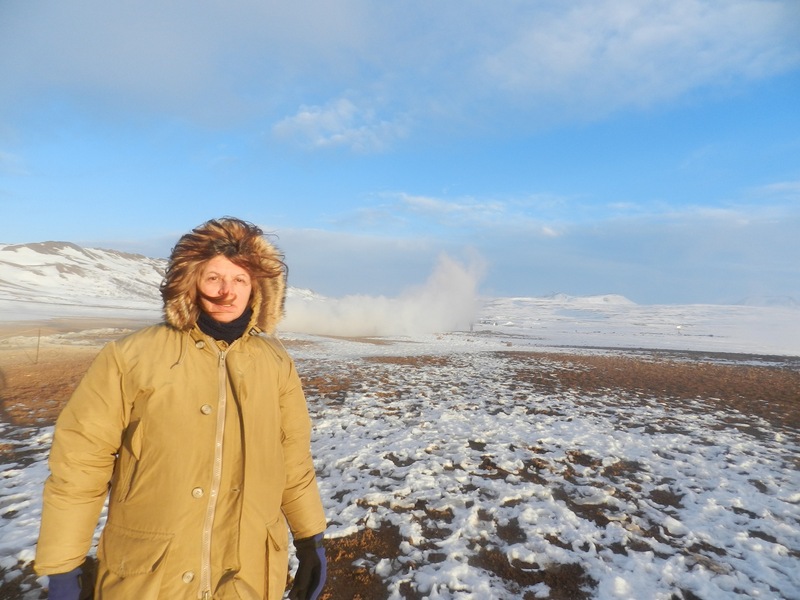 It is so that I met Haldor,a very friendly and intelligent young man, the son of my Icelandic friend Halldora who has been helping me throughout my dramatic emotional experiences in the North of Iceland. In akureyri I met Fikka, Fredrika, a very nice gentle geologist who invited me and my friends artist to a dinner at her partner’s house. A very tasty soup and some interesting info about the id Atlantic ridge and other geological subjects warning us about winter tourism towards the middle of the country where the wind blizzards and bad weather may cause problems to the tourists themselves and to the Icelandic rescue teams volunteers. It happens when tourists try to do everything in one day and see all the beauty with an ordinary, superficial attitude. The intollerable status of being a tourist. 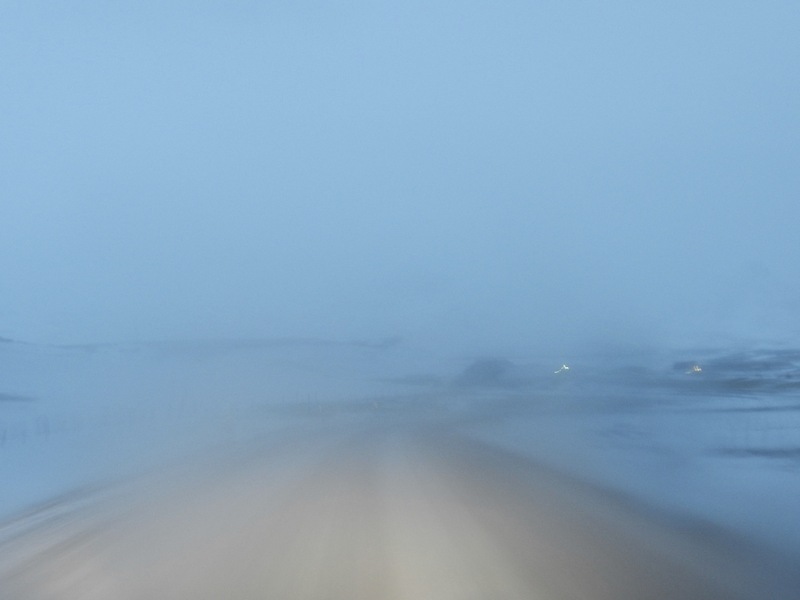 A blizzard caught us during our going back from Myvatn Lake, quite a nice area with geisers, thermal pools, falls, all what one turist needs to say back home that has actually visited this amazing land. This entry was posted in Uncategorized on February 14, 2015 by vittoria chierici. 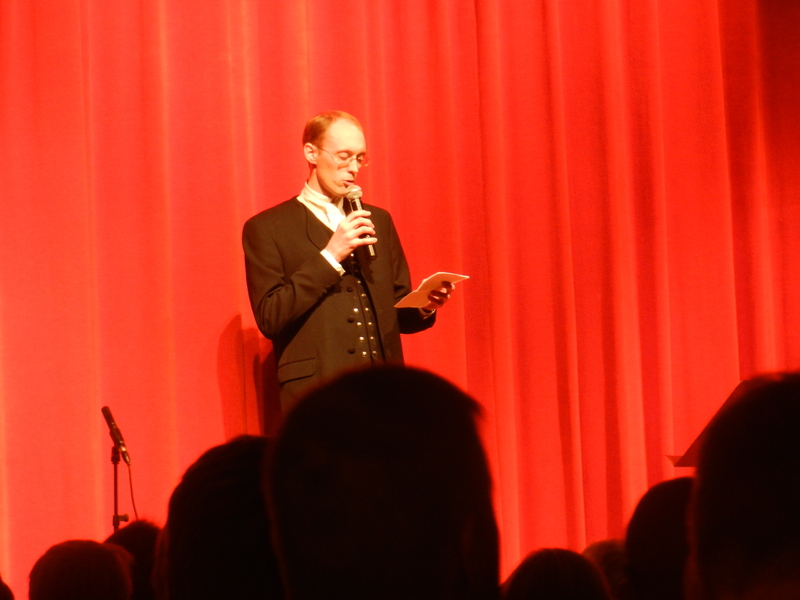 Here are some pix taken during the Þorrablót celebration at Skgastrond on February 7 2015. The musical based on a satire about the local characters and activities was done really beautifully ! 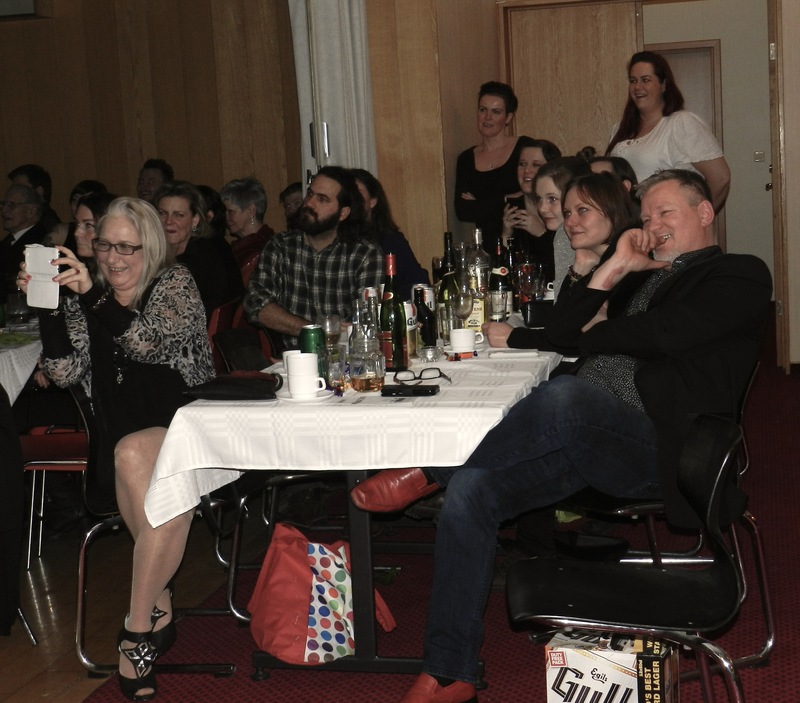 Beautiful party on February 7 2015, at the community hall in Skagastrond, for this Icelandic traditional Thorrablot. Very interesting the preparation of the old times food, but so strong in taste that I hardly had just a bit of the most eatable part. Here is a list of this food and the story of this day of celebration. 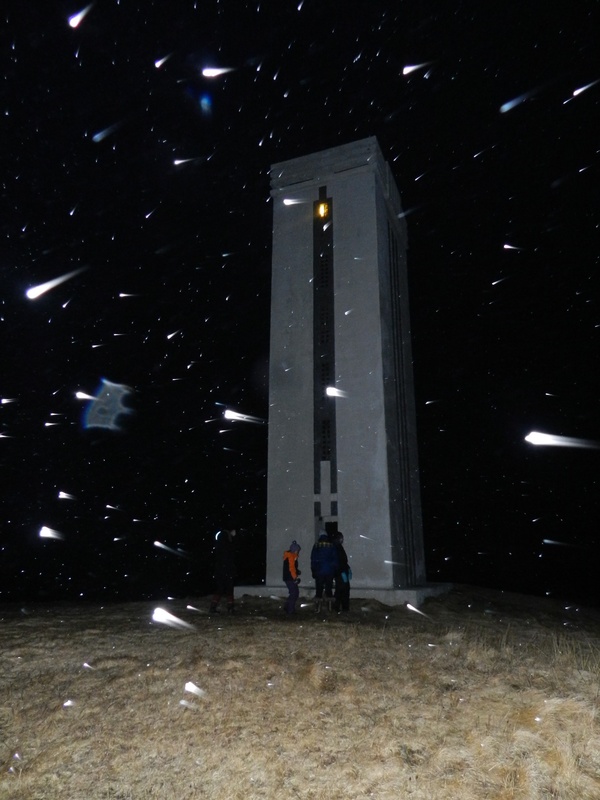 Some history about this celebration: “Þorrablót (Icelandic pronunciation: [ˈθɔrːaplout]) is an Icelandic midwinter festival, named for the month of Þorri of the historical Icelandic calendar (corresponding to mid January to mid February).The historical context is from the Orkneyinga saga, where Þorri (“Frost”) is an early Norwegian king, the son of Snær (“Snow”). Hversu Noregr byggðist (“How Norway was settled”, 12th century) states that the Kvens offered a yearly sacrifice to Þorri at mid-winter.The modern festival arose in the second half of the 19th century, with the Romantic nationalism of the time, comparable to Burns night in Scotland. 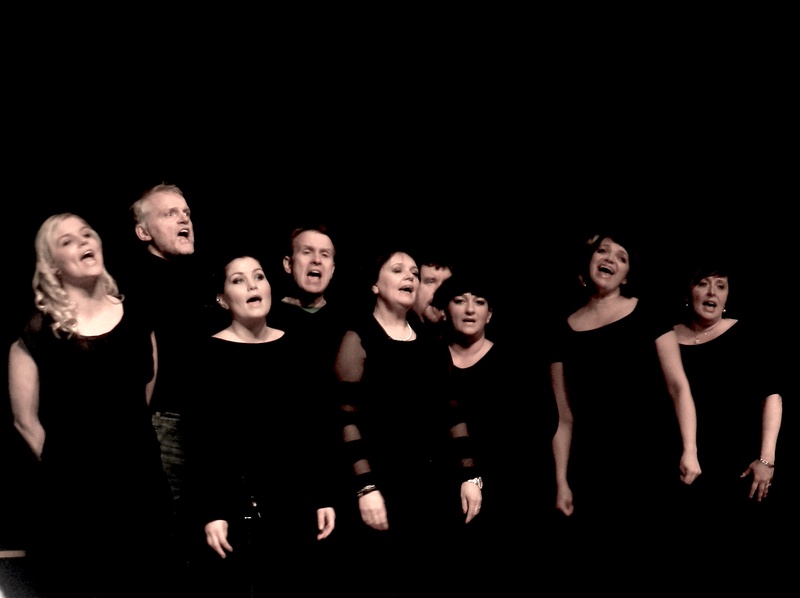 The first known celebration was reportedly organised by the association of Icelandic students in Copenhagen in 1873, and by other societies active in the Icelandic independence movement of the time (Iceland received a constitution in 1874, and was recognized as a kingdom in personal union with Denmark in 1918). 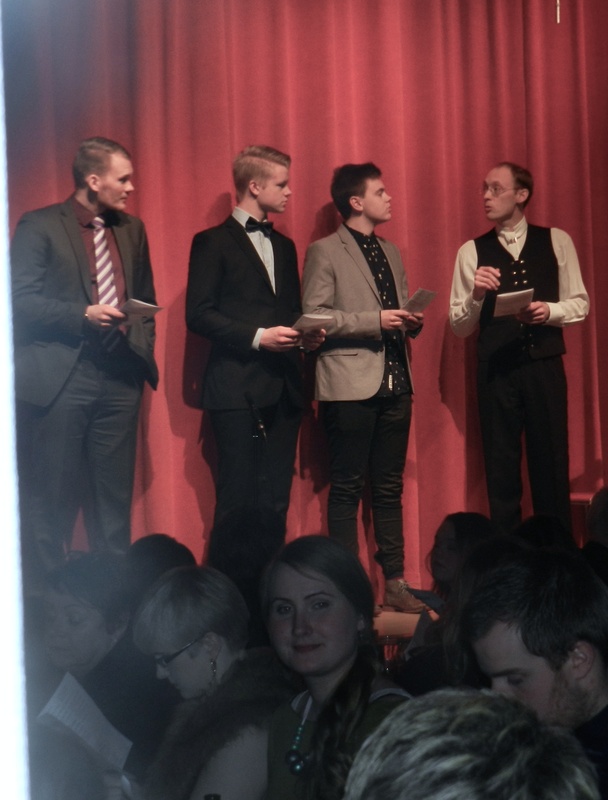 The Þorrablót is an evening with dinner where participants hold speeches and recite poems, originally to honour the Norse god Thor (Þórr), whose name is taken to be associated with Þorri. Calling the feast a blót (a feast held in honor of a god in Norse paganism) makes clear the reference to pagan times, which many nationalists of the 19th century considered a golden age of Icelandic history”. ( quoted from Wikipedia En). 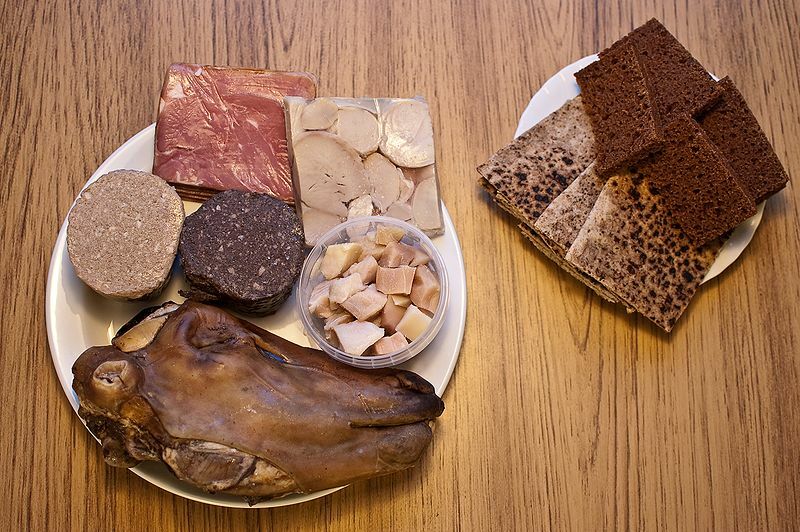 “Þorramatur is a selection of traditional Icelandic food, consisting mainly of meat and fish products cured in a traditional manner, cut into slices or pieces and served with rúgbrauð (dense and dark rye bread), butter and brennivín (an Icelandic akvavit). 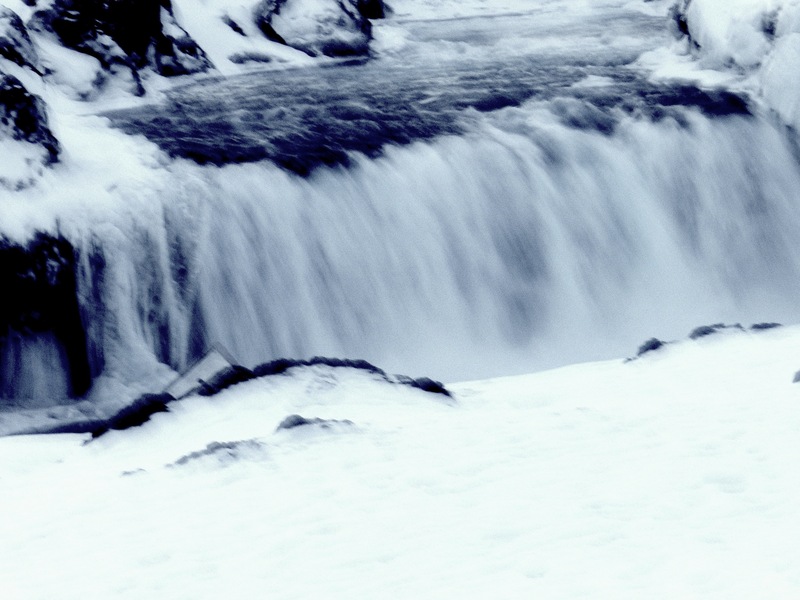 Þorramatur is consumed during the Nordic month of Þorri (Thorri), in January and February, particularly at the mid-winter feast of Þorrablót (Thorrablot) as a tribute to old culture. 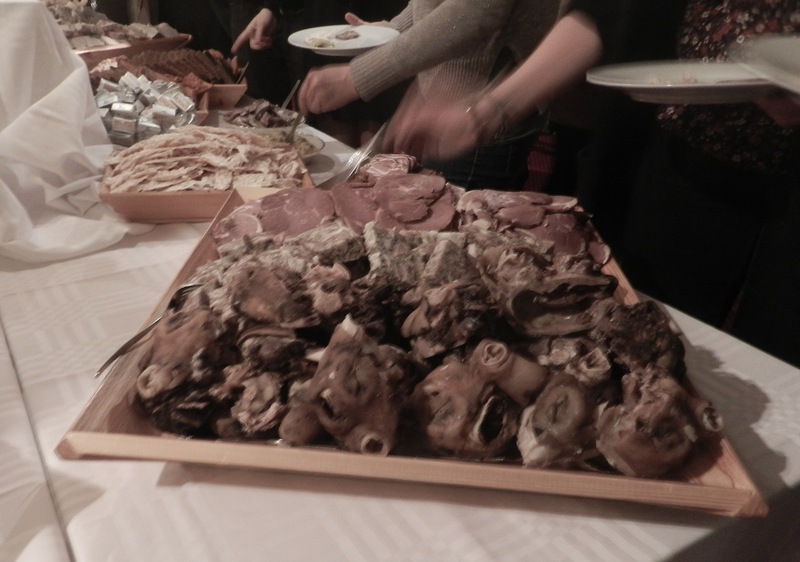 Being thus connected with the tradition of Þorrablót festivals, Þorramatur is most often served as a buffet…The traditional method of storing meat by submerging it in fermented whey, which gives the food a characteristic sour taste, is unfamiliar to most generations of Icelanders alive today and therefore a Þorramatur buffet usually has a choice between sour and unsoured pieces of the same food, served on separate trays as the acid readily contaminates food with which it comes into contact. However, some of the food, for example the rams’ testicles, has to be cured by the acid before serving. 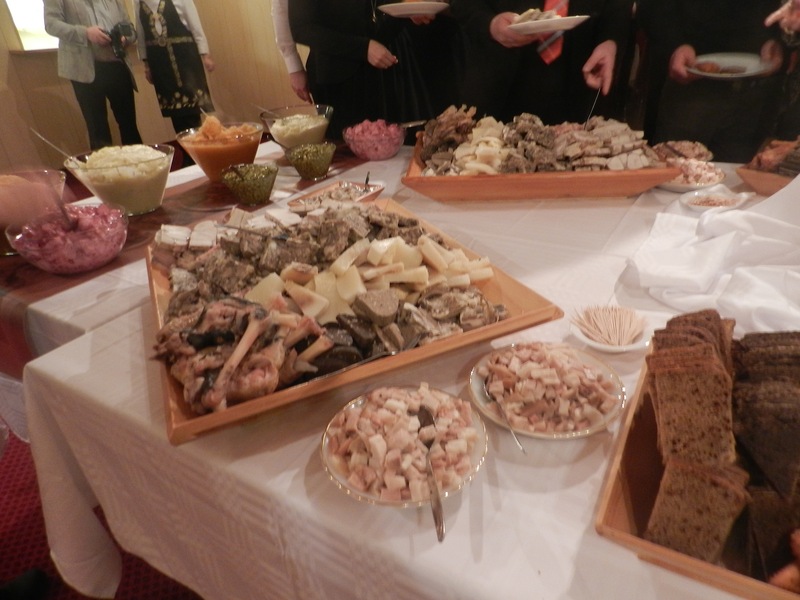 A number of foods have been added to the buffet that have never gone out of fashion in Icelandic cuisine, such as smoked lamb, fermented shark and dried fish, which are still commonly consumed in all seasons. Þorramatur also may include some novelties, traditional food that was strictly regional and even rare as such, and unfamiliar even to the older generation. Examples include seals’ flippers, known only from the Breiðafjörður area, which is sometimes, albeit rarely, served as part of Þorramatur. 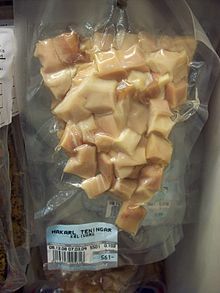 Kæstur hákarl, fermented Greenland shark. Súrsaðir hrútspungar, the testicles of rams pressed in blocks, boiled and cured in lactic acid. Svið, singed and boiled sheep heads, sometimes cured in lactic acid. Sviðasulta, head cheese or brawn made from svið, sometimes cured in lactic acid. Lifrarpylsa (liver sausage), a pudding made from liver and suet of sheep kneaded with rye flour and oats. Blóðmör (blood-suet; also known as slátur lit. ‘slaughter’), a type of blood pudding made from lamb’s blood and suet kneaded with rye flour and oats. Harðfiskur, wind-dried fish (often cod, haddock or seawolf), served with butter. Rúgbrauð (rye bread), traditional Icelandic rye bread. Hangikjöt, (hung meat), smoked and boiled lamb or mutton, sometimes also eaten raw. Lundabaggi, sheep’s loins wrapped in the meat from the sides, pressed and cured in lactic acid. 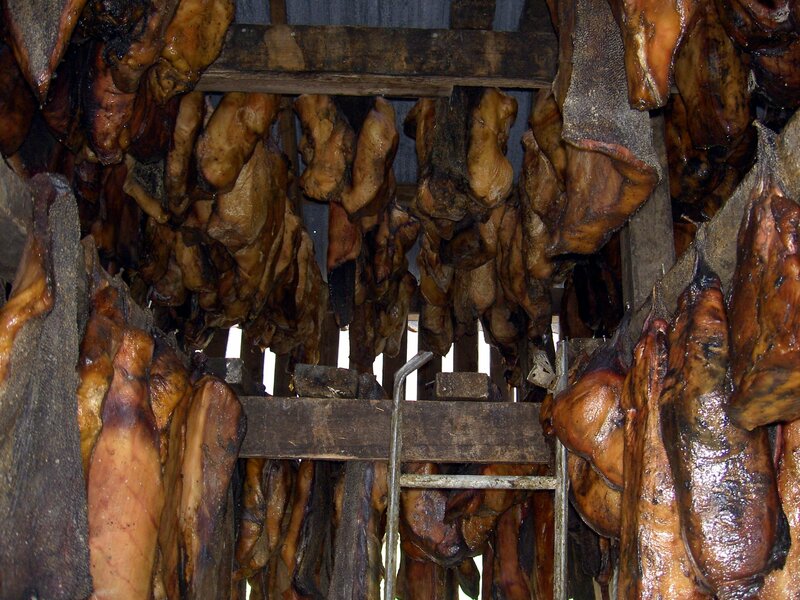 More news about the Greenland shark and how to prepare Kæstur hákarl out of it. 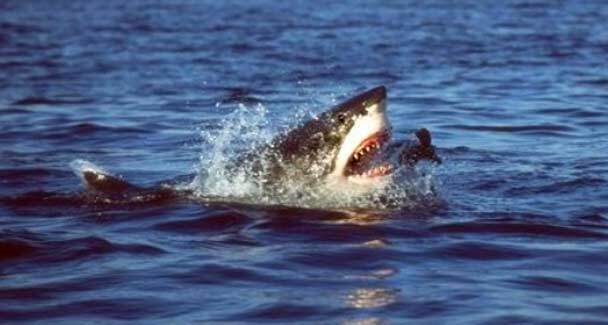 “This is one of the largest living species of shark, of dimensions comparable to those of the great white shark. Greenland sharks grow to 6.4 m (21 ft) and 1,000 kg (2,200 lb), and possibly up to 7.3 m (24 ft) and more than 1,400 kg (3,100 lb).However, most Greenland sharks observed have been around 2.44–4.8 m (8.0–15.7 ft) long and weigh up to 400 kg (880 lb).Males are typically smaller than females. It rivals the Pacific sleeper shark (possibly up to 7 m or 23 ft long) as the largest species in the family Somniosidae.” ( Quoted from Wikipedia En). 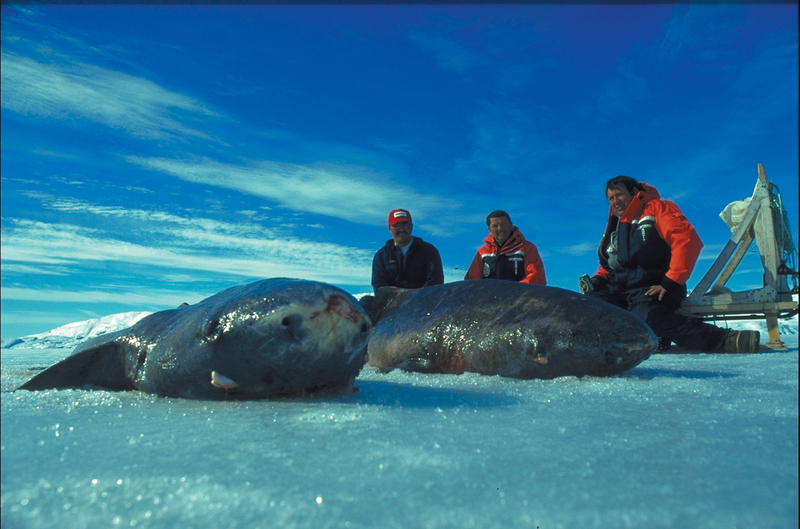 “The flesh of a Greenland shark is poisonous. This is due to the presence of the toxin trimethylamine oxide, which, upon digestion, breaks down into trimethylamine, producing effects similar to extreme drunkenness. Occasionally, sled dogs that end up eating the flesh are unable to stand up due to the neurotoxins. Similar toxic effects occur with the related Pacific sleeper shark, but not in most other shark species, whose meat is often consumed fresh. However, it can be eaten if it is boiled in several changes of water or dried or fermented for some months to produce Kæstur Hákarl, often Hákarl for short. Traditionally this was done by burying the shark in boreal ground, exposing it to several cycles of freezing and thawing. It is considered a delicacy in Iceland and Greenland” ( Quoted from Wikipedia en). 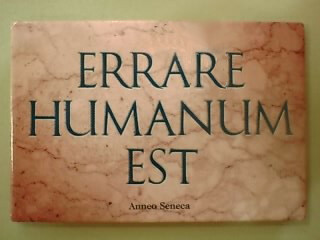 “Il vento è aria che spira” lo scrive Lucio Anneo Seneca nelle sue Questioni Naturali (I Venti: quinto libro). Il vento che soffiava mentre tornavao a casa dallo studio era piu’ che un vento. Piu’ o meno una bufera ( gale) forza 6 – 7 quasi tutti i giorni col cielo sereno o con la neve. Uno stormo di caccia in picchiata, il ruggito di migliaia di leoni all’unisono, un suono come di timpani, con un ritmo cadenzato dalle raffiche a 50KM/h. Il vento e’ stato per me una presenza molto piu’ inquietante a terra che sulla nave nell’estate del 2012 quando il mare si alzo’ a forza 8. Era divertente seguire il rollio della nave. A terra invece il vento e’ diverso. Ti bastona. Ti piega . Roaring like thousands lion, the wind was beating up a land with no trees no obstacles; a scream howled with a deep muffled sound paced by gusts over 50/60KM/h. I felt scared, like a trapped animal. Il vento è il movimento di una massa d’aria atmosferica da un’area con alta pressione (anticiclonica) ad un’area con bassa pressione (ciclonica). Wind is the movement of air between regions of high pressure to regions of low pressure. The larger the difference between high and low pressure (shown by closely spaced isobars on a weather map), the faster the wind. Wind speed and direction is also influenced by other factors, including the Coriolis force and surface friction. The Coriolis force, caused by the rotation of the Earth, changes the direction of the wind. In the northern hemisphere, the Coriolis force deflects the wind to the right, so that winds circulate in a clockwise direction around high-pressure regions, and counterclockwise around low-pressure regions. The opposite occurs in the southern hemisphere. Surface friction caused by the movement of air across land and ocean surfaces can also affect wind speed and direction. 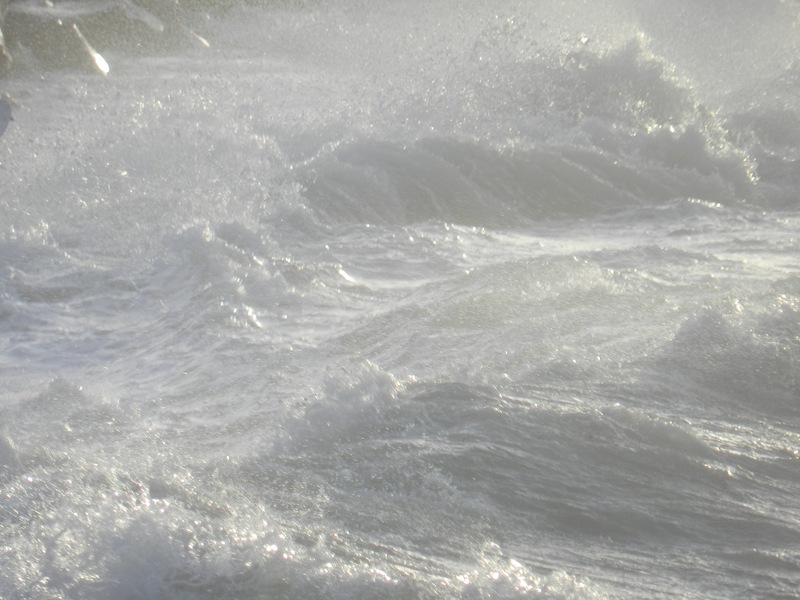 Winds in the Arctic can vary a lot in strength, but they are typically light. Winds tends to be stronger in the Russian Arctic, where there are more storms, than in the Canadian Arctic. Strong temperature inversions form in winter, which slow winds near the ground. Temperature inversions are where air at the surface is cooler than the air above. These inversions disconnect the surface air from the air above. 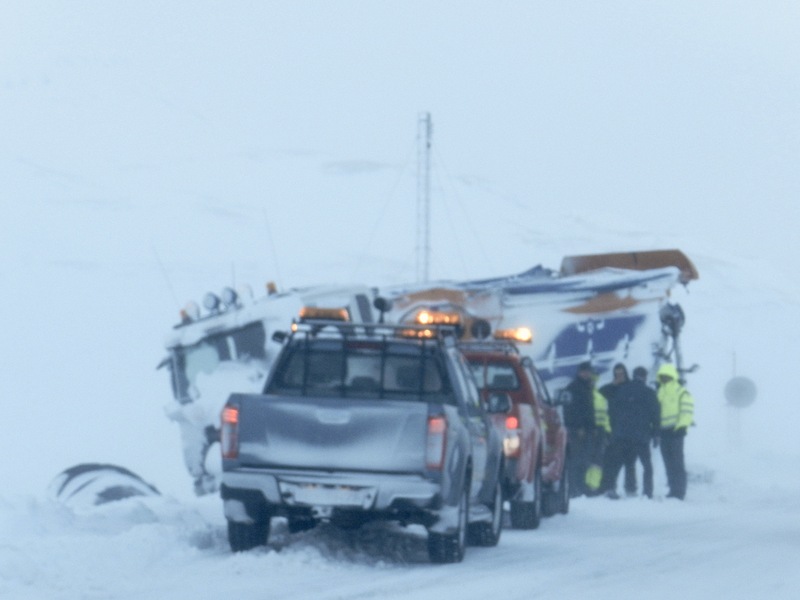 Although Arctic winds are typically light, strong gales that can reach hurricane strength can occur and last several days. 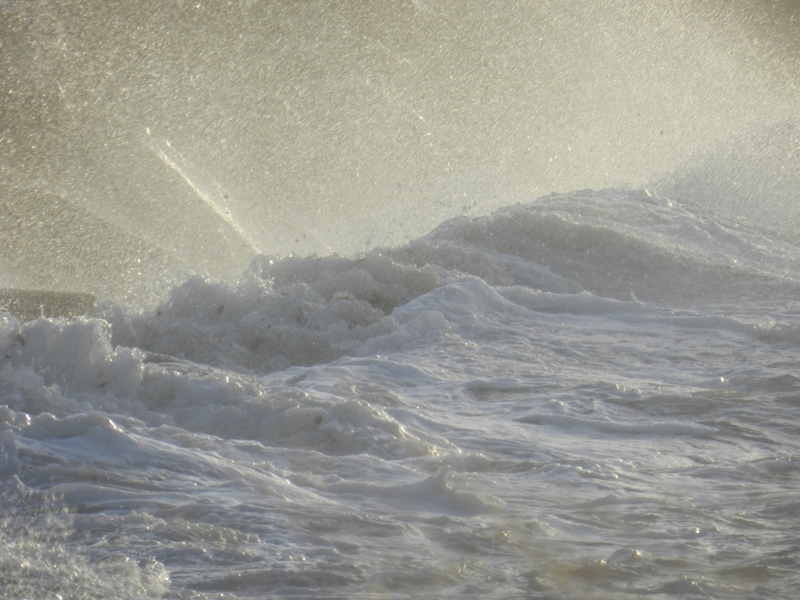 In the winter, these strong winds scour the snow from exposed areas and form large snow drifts in sheltered areas. Strong winds increases the wind chill factor. Wind chill refers to the cooling effect of any combination of temperature and wind, expressed as the loss of body heat in watts per square meter of skin surface. The body has a very thin layer of still air immediately adjacent to it called the boundary layer that helps to insulate the body from heat loss. As wind speed increases, the thickness of the boundary layer diminishes, and the rate of sensible heat loss from the body increases. 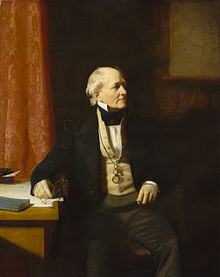 The scale was devised in 1805 by Francis Beaufort (later Rear Admiral Sir Francis Beaufort), an Irish Royal Navy officer, while serving in HMS Woolwich. 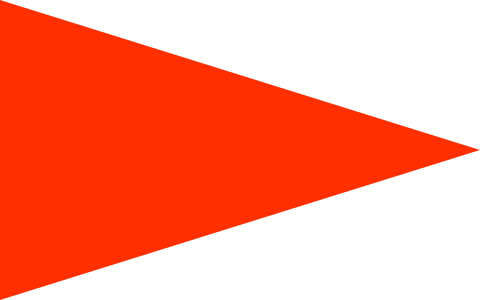 The scale that carries Beaufort’s name had a long and complex evolution from the previous work of others (including Daniel Defoe the century before) to when Beaufort was a top administrator in the Royal Navy in the 1830s when it was adopted officially and first used during the voyage of HMS Beagle under Captain Robert FitzRoy, Today, many countries have abandoned the scale and use the metric system based units, m/s or km/h, instead, but the severe weather warnings given to the public are still approximately the same as when using the Beaufort scale. Where v is the equivalent wind speed at 10 meters above the sea surface and B is Beaufort scale number. For example, B = 9.5 is related to 24.5 m/s which is equal to the lower limit of “10 Beaufort”. Using this formula the highest winds in hurricanes would be 23 in the scale… Today, hurricane force winds are sometimes described as Beaufort scale 12 through 16, very roughly related to the respective category speeds of the Saffir–Simpson Hurricane Scale, by which actual hurricanes are measured, where Category 1 is equivalent to Beaufort 12. However, the extended Beaufort numbers above 13 do not match the Saffir–Simpson Scale. Category 1 tornados on the Fujita and TORRO scales also begin roughly at the end of level 12 of the Beaufort scale, but are independent scales – although the TORRO scale wind values are based on the 3/2 power law relating wind velocity to Beaufort force. Note that wave heights in the scale are for conditions in the open ocean, not along the shore….winds of force 8 or 9 winds bringing about a gale warning, force 10 or 11 a storm warning (“a tropical storm warning” being issued instead of the latter two if the winds relate to a tropical cyclone), and force 12 a hurricane force wind warning (or hurricane warning if related to a tropical cyclone). ( Wikipedia En). This entry was posted in Uncategorized on February 13, 2015 by vittoria chierici. Spakonufell ( Soothsayer’s Mountain is the old name of the mountain embracing the homonymous Cape and the bay of Skagastrond. The name’s origin is related to the story of Thordis the fortune teller or prophetess who lived at the foothill’s mountain, in her farm, Fell, around the 10th century. Quite a respected, intelligent woman who fostered the first missionary, Thorvaldur the Far – Traveled Viking. The first information about a settlement at Skagaströnd comes from the 10th century. 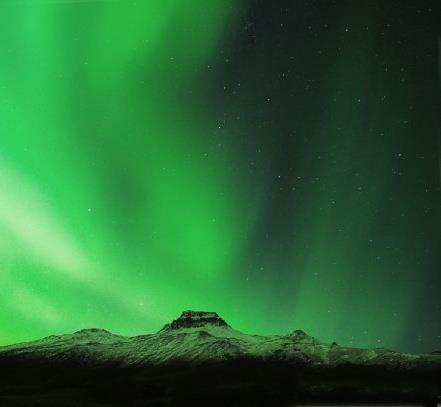 Then a prophetess by the name of Þórdís lived there at Spákonufell (Prophetess Hill). She crops up throughout the Icelandic sagas and her reputation was ambivalent as she was skilled in witchcraft. Þórdís was the foster mother of the first missionary of Iceland Þorvaldur Víðförli Koðránsson. 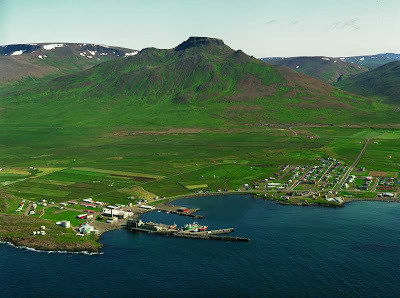 Þóroddur the son of Snorri the good also lived there. The sagas tell that that Þórdís walked up to Spákonufell every day (646 meters over sea level) and combed her hair with a golden comb. It is said that she had hidden her gold in the mountain and put a spell on it so that no one could use it except women which were not baptised and who hadn’t learnt any of Gods words. Alta 646 metri, la montagna prende il nome da unaprofetessa, forse considerata strega, Thordis che fondo’ qui la propria fattoria, dal nome Fell. 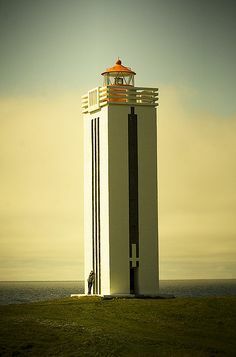 Thordis era una delle prime colone islandesi, tutt’ora rispettata per avere adottato il primo missionario che evangelizzo’ l’Islanda, Thorvaldur Kothransson. Siamo attorno all’anno 980. This entry was posted in Uncategorized on February 7, 2015 by vittoria chierici. …it is the title of an extraordinary book I read here in Iceland, in English . 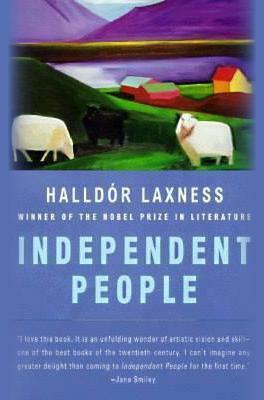 His author Halldor Laxness, won the Nobel Prize in Literature with this novel of an extraordinary deepness into the soul and the history of Icelandic modern development. Here is a quotation from Wikipedia: Halldór Kiljan Laxness ( born Halldór Guðjónsson; 23 April 1902 – 8 February 1998) was a twentieth-century Icelandic writer. Throughout his career Laxness wrote poetry, newspaper articles, plays, travelogues, short stories, and novels. Major influences included August Strindberg, Sigmund Freud, Sinclair Lewis, Upton Sinclair, Bertolt Brecht and Ernest Hemingway. 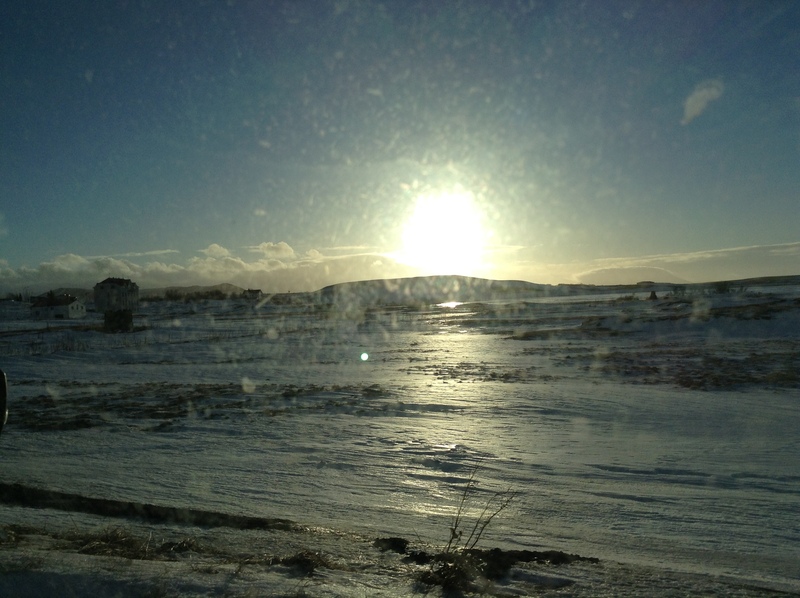 The first two days in Reykjavik, after my arrival from New York, on January 2. I was depressed. Probably for the lack of light most of the daytime. I met finally Ruri. 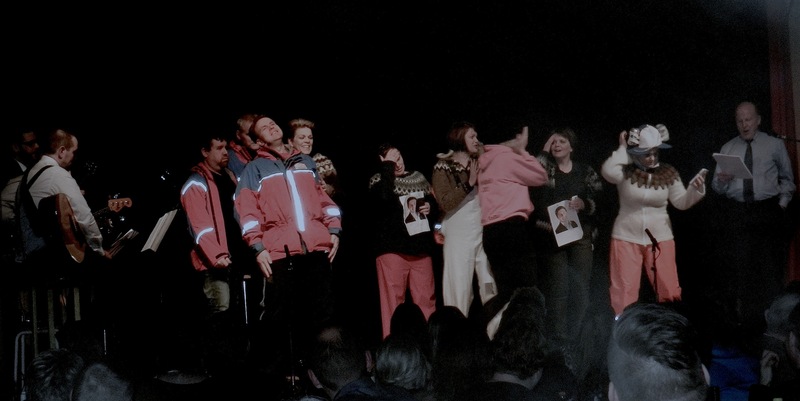 We wrote each other quite a few times as being in touch thanks to our common friend, art historian from Akureyri – Alicante, Halldora Arnardottir. Ruri got me out of Kex hostel and took me for some rides by car which I aprreciated very much. We went to a restaurant, museums, harbor. She showed me a beautiful book about her work that explained to me better than what I had seen in internet. Ruri whose all name is Thuridur Fannberg, is among the greatest artists I have ever met in all my traveling around Europe and USA. She represented the Iceland padillion at the Venice Biennale 2003, with the interactive installation Endangered Waters. 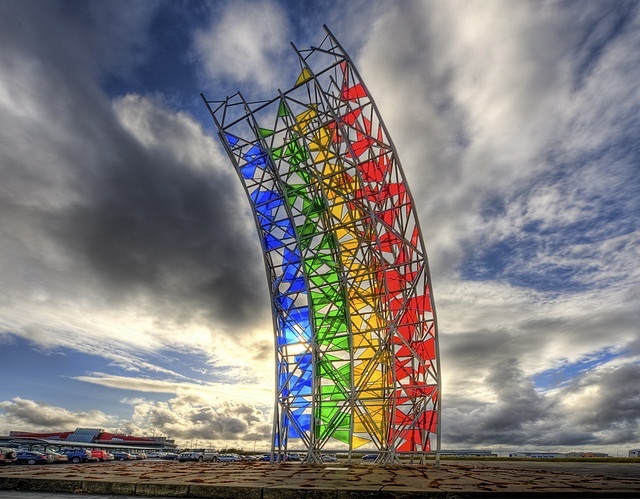 Her sculture from her Rainbow’s project is outside Reykjavik airport, Keflavik. 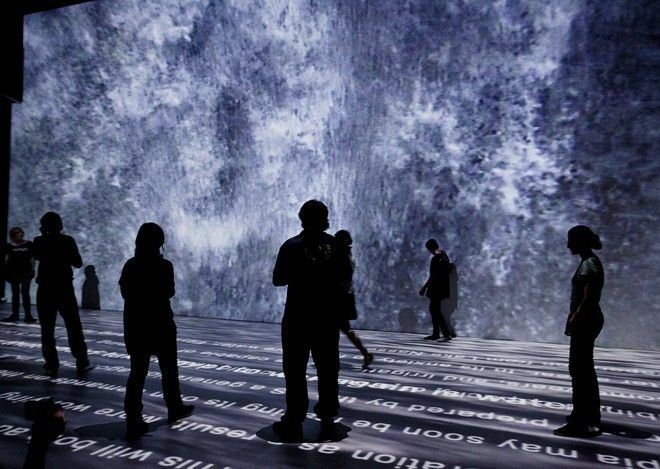 Here is an image of Ruri’s enchanting piece: Archive – Endangered Waters, 2011. This entry was posted in Uncategorized on February 6, 2015 by vittoria chierici.